Across the ice belt we deal with all sorts of weather. A common question about winter sports is how to stay warm while spending time in the cold. People ask, “What are the best boots, best suits, or best gloves?” Cold-weather clothing options have exploded in the outdoors marketplace. Choose high-quality gear, but you have to wear it properly for it to perform as advertised. My biggest tip to staying warm while ice fishing is to avoid getting over-heated. Wear layers and only enough to stay warm. Keep your core warm and that will transfer heat to your hands and feet. I don’t “suit up” until I reach the lake. Once I arrive, I put on my bibs, warm socks, boots, and a sweatshirt. If it is really cold and windy, I’ll add my coat. 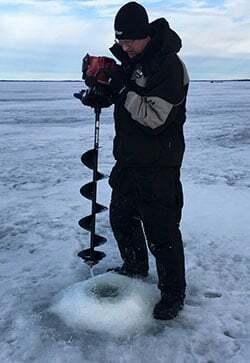 Activity levels vary greatly while ice fishing, from dragging shelters and gear out to your fishing spot, drilling holes, to sitting on a bucket waiting for the fish to bite. When you increase activity, remove layers to avoid becoming a sweaty mess. Then as your core temperature starts to drop, add layers to stay warm. By keeping yourself dry, warm, and comfortable out on the ice, you can extend your fishing trips and earn a better chance at catching more fish! All of the above goes for kids too! Don’t bundle them up during a warm car ride. Wait until you arrive to fully suit up. Keep them warm and dry out on the ice, and they’ll have a more enjoyable experience – then beg you to take them again. Good luck fishing and stay safe, and warm! Click HERE to read more hunting and fishing tips by Jason Revermann.